Mapping the historic canals one lock at a time! Inspired by the rich local map and photo collections of Welland Canal history, this project (HWCMP – also available via Geohist Portal) illustrates an HGIS approach to reconstructing the past that has since captivated a large local audience – simply because it tells amazing stories! Although there are many approaches to historical GIS research, this one combines current mapping technologies with historical maps, air photos, and images, to reconstruct the three historic canals as they would appear on today’s landscape. While there are many books, maps, and websites that document the historic canals, there is little that represents the historic mapping of the canals with the detail it deserves. Many technologies from the suite of ArcGIS products available through the Esri educational site license were utilized: ArcMap Desktop, Collector for ArcGIS, ArcGIS Pro, ArcGIS online (AGOL), Web AppBuilder for ArcGIS, and Esri Story Maps. First built in 1829, the Welland Canal routed ships to circumvent Niagara Falls – a height of 100 metres (325 feet) – between Lake Ontario and Lake Erie. No other canal in the world has overcome a slope as steep as the Niagara Escarpment to transport ships. Yet its history is known by few. 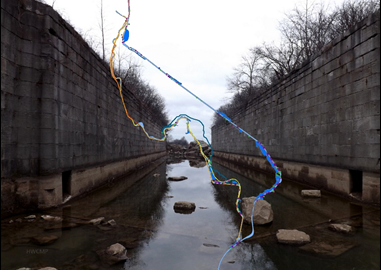 Using HGIS processes, the three 19th century canals in St. Catharines and Thorold, Ontario – the First (1829); Second (1845), and Third (1887-1932) – were digitally recreated to overlay on the current landscape. (The current, and fourth, Welland Ship Canal is well documented and is not yet history!) Although most historic features have been bulldozed or left for ruin, many of the Second and Third canal features have survived in one way or another (if you know where to find them). Building on the Welland Canals Google Earth project of several years ago, routes of the canals and its locks are no longer simple lines and points on a map. 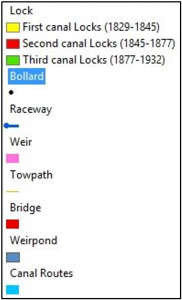 Extensive heads-up on-screen digitizing using ArcMap processes has resulted in an accurate representation of the historic canals – including every route, lock, bollard, weir, weirpond, bridge, tunnel, pier, and raceway! The geodatabase is unique with detail never before created. It offers a solid foundation for which to build other geodatabases, such as period industry activity, historical road networks, vegetation and other landscape changes. The data was recently used by an archaeology student, David Connelly, to create a proposal for re-purposing the historic locks and environs using 3D models: Re-Engaging the Welland Canals. An optional field was included in the geodatabase to enter brief text descriptions. However, when hiking in sub-zero temperatures this didn’t amount to much. Many of these descriptions were added later in AGOL and are included in the pop-up box with each feature. The photo and video attachments were critical in this assessment. Later, these would be deposited in the Brock Digital Repository for historical record, but more importantly to provide a sustainable url for including hyperlinks in the AGOL project. Some preliminary mapping of the historic routes and locks also proved to be useful while hiking. This data was included as part of the map used with Collector. When in the field, I was able to determine an approaching canal lock or feature on my phone that was not clearly visible on site. If remnants were found, its location captured in Collector was a ground-truthing point that could later be used to accurately map the feature. This was particularly useful for locks and weirs where stone and concrete rubble were evident but the structure was deteriorating. High accuracy GPS or GPS averaging was not used. The resolution of Collector was at best within 3-5 metres, and to achieve this took patience while the iPhone reconfigured to the zoomed location. But it was good enough for the purpose intended! Attributes for the Lock and Weir feature classes included: visibility, condition; accessibility, and extensive description with photos – all included in the custom pop-up when a feature is “clicked” (selected) within the map view. 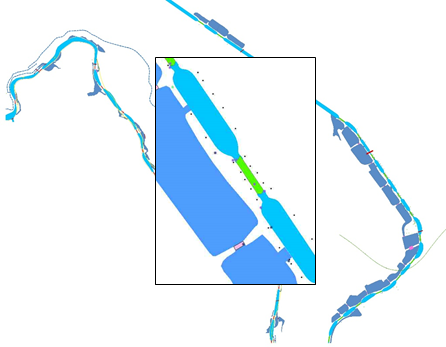 The web app allows the user to interact with the historic routes of the canals, select its features and view modern photos of its current condition. Historical photos are also planted in the feature class tables and in some of the feature inventory pop-ups (the Collector points) that provides a “then and now” comparison of canal landscapes. Some are very startling, such as the Canal Valley through downtown St. Catharines (below) where the tranquil meander of the First and Second Canal waters have been replaced with parking lots, arenas, and a major highway. It’s a shame! But a reminder of why we engage in HGIS research in the first place. The HWCMP digital vector data is currently available as open data in AGOL. It is anticipated that the data will also be accessible in several portals, including Brock’s Digital Repository, Scholars GeoPortal, and Niagara Open Data portal. One of the struggles is establishing an appropriate repository for data preservation, which continues to be investigated. To date, the project has been presented to the Historical Society of St. Catharines, The Brock Library staff, and has upcoming dates for the St. Catharines Public Library, Brock Geography Masters speaker series, the St. Catharines professional business retirees, and Carto 2018. An audience yet to capitalize on is the elementary/secondary school students! The HWCMP talk is popular in the community because of the stories it tells. One is the story of the attempted terrorist attack to blow up Lock 24 of the third canal in 1900 – where the grandson of the convicted made contact with me, due to the web exposure of the HWCMP. Others are the stories about mapping the canal features, uncovering remnants of old buried tunnels and providing image comparisons that take one back in time. Photo comparisons provide a remarkable “wow” factor to visualize landscape change. If there’s a compelling story to tell, it will seize the audience. I attended Colleen Beard’s presentation at the St Catharines Historical Society night to a full house seated plus standing room attendants at the St Catharines Lock 3 Museum last year, 2017. Her work, with ‘on-the-ground-research’ help from volunteer assistants such as Rene Ressler of Friends of Welland Canals/Face Book Group, is absolutely indescribably – amazing. Her 1 hour thrilling exciting presentation was not nearly enough. She could have tripled her talk time and none of us would have noticed that 3 hours would have passed by in a flash. My fervent hope is that Beard’s HWCMP project will finally inspire the saving and even restoration of at least some of the still existing parts of the locally, nationally, and globally historic 2nd and 3rd Welland Canals of Canada’s Niagara Region in the very near future.